Meet the 2018-19 CP Swing and Drop Dead Blues officer team! Marlee Litzinger is one busy lady! If she isn’t out on the dance floor wowing onlookers with her amazing skill, you can find her conducting research and slaying the Aerospace Engineering game. She is smart, confident and ready to take charge, which helps her be the best Blues President she can be! If you ever have a question about something Blues related, Marlee is the person to ask as she always strives to expand her knowledge and learn more about Blues, and dancing in general. As a Master’s Aerospace Engineering student, Marlee is interested in the effects of atomic oxygen on the structural integrity of various materials. However, she also pursues her love of dance through the Dance Minor program at Cal Poly. A dance with Marlee is sure to be out of this world! Here comes the heart and soul of the swing club, our president Holley Shugart! Holley is a 4th year Food science major with a passion for cooking, baking, and dance. This girl has sass in her shoes and beauty in her soul. Her style and flair for the dramatic always leaves you with a smile. If you ever want to start up an interesting conversation with her, you need look no further than asking about her skeleton earrings and eccentric socks. She has a love of Swing, Blues, and Jazz dancing and has been in the Cal Poly spring dance show for the past two years. She has danced her way into all of our hearts, and to dance with her one need only ask! Cami Asher is an up and coming Lindy Hop/Balboa prodigy who dedicates her spare time to dancing across California and the rest of nation. 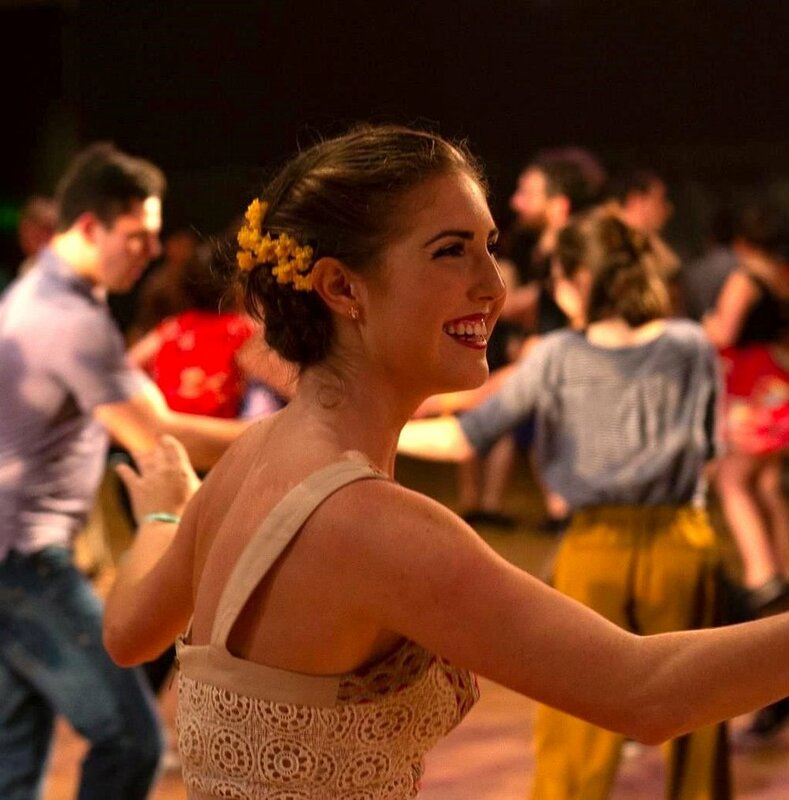 Her genuine passion, discipline, and work ethic for swing dancing is unparalleled. Cami is constantly bettering her craft by attending workshops, studying videos of swing dancers, and improving her solo jazz technique. The skills she has gained from her background in ballet, tap, and figure skating have flawlessly translated into her ability to produce innovative rhythms, beautiful shapes, and clean lines in her choreography and social dancing. Although she began swing dancing in high school, she has already earned several accolades. For example, she won first place at both the Amateur Lindy competition at Inspiration Weekend 2018 and the Open Balboa competition at Camp Jitterbug 2018, and this is only this beginning of her success. At this rate, Cami Asher is well on her way to becoming a household name in the swing community. Introducing Secretary Lina Zavala! Lina hails from San Diego, CA and is a liberal studies major here at Cal Poly. With this degree she hopes to one day become a teacher! Lina is such positive light on the dance floor! When she’s not shining by showcasing her jazz moves and variations, she sparkles through compliments and kind words. Not only is Lina an amazing dancer, she’s also one of the sweetest souls in the house! This SLO native can always be found with a huge smile on her face and killin’ it on the dance floor! She has a beautiful energy that spreads to everyone around her and she is always ready to jump in and help when needed! Kate is a second year business major, serving as Treasurer for both clubs this year! When she isn't out on the dance floor, Kate loves being outdoors and hiking. Definitely don't miss a dance with Kate! Meet Jenny, our advertising expert! Have you checked out our Insta story? That’s Jenny! More impressive than her social media skills is her extensive knowledge of plants. Take Jenny on a walk around campus and be amazed as she gives you the scientific names of (most) all the plants at which you point. Originally from Etna, a small town in NorCal, Jenny values community & can make anyone feel at home. Jenny is a 3rd year Plant Science major at Cal Poly & a well-traveled dancer. When she’s not bulking up on her plant knowledge or working at Cal Poly’s plant shop, she’s traveling for dance! Be sure to grab a dance with this small-town girl with a big personality! Meet Grace Leonard! This fashionable lady is our club graphic designer, responsible for all the cute and quirky postcards, posters, and icons for CP Swing and DDB! From Rocklin, CA, Grace is entering her 3rd year in Cal Poly’s Graphic Design program. To her friends, Grace is the queen of spontaneous baking, painting Jeff Goldblum, and doing elaborate makeup looks. Make sure to find her in the blues room while she’s strutting her stuff! They were elected at the beginning of April for the 2019-2020 school year, and we are so happy to have them! Sign up for our mailing list for weekly updates!